Many times, we whipped out our iPhone or iPad to record a moment that we want to watch later without noticing the right orientation we hold our devices. When we transfer and play the recorded videos on computer, we find that the recorded videos are upside down, or not in the suitable orientation for the situation. When this happens, most Apple users will turn iMovie for help. But how? There are many users ask questions like "how can you rotate a video in iMovie 10/9/8?" Okay, in this post, we will show you how to rotate a video in iMovie on iPhone, iPad and computers. A: MacX Video Editor let you rotate video in 90°, 180°, 270°, 360° clockwise, and also horizontal mirror flip. You can rotate videos files in MP4, MOV, AVI, MKV, AVCHD, MTS, 3GP or others freely. iMovie is free available for Apple users running on macOS 10.11.2 or later. For earlier users, you may need to download or purchase it from the Apple Store. Below is a guide on how to rotate a video in iMovie in 90 degrees, 180 degrees, 270 degrees on Mac computers. The process may differ slightly if you rotate video in iMovie 10.1, 10.0, 9, 8 or earlier. Step 1: Click iMovie icon in the dock and launch it. Select Import Movies from the File menu and select the clip you want to rotate in the browser or timeline. Then choose to add to existing Event or create new event. Step 2: Select your video clip from the Project Library and click the Cropping button on the control bar in the middle and you will see two rotating arrow buttons displayed on the upper right corner. 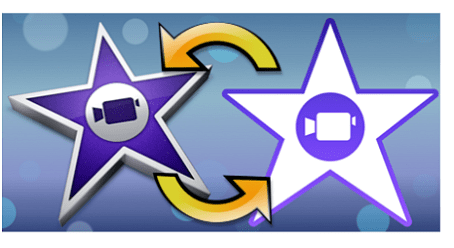 Step 3: Now you can click either the iMovie video rotate clockwise or counterclockwise button and start rotating video in iMovie now. Step 4: After you rotate a video clip in iMovie to the right orientation, click the Apply button with a tick. You can remove the rotating adjustment with the Reset button. Then click the Share menu and select Export Movie from the drop-down menu to export the correct video. 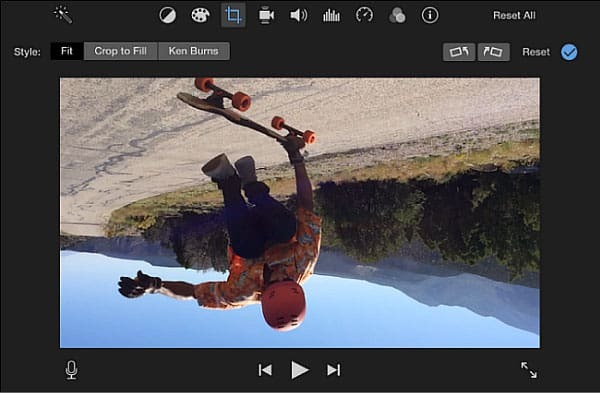 If your video is based on iOS devices, iMovie for iOS is a direct way to flip iPhone videos to any degree. The iMovie app is free for users running on iOS 7 or later. That is to say, users can freely rotate video in iMovie on iPad Air, mini, iPhone X, iPhone 8/Plus, iPhone 7/Plus, 6/6 Plus, 5S, etc. Below let's see how to flip a video in iMovie on iPhone iPad. Step 1: Open iMovie on iPhone iPad and choose the video you want to rotate from the list. 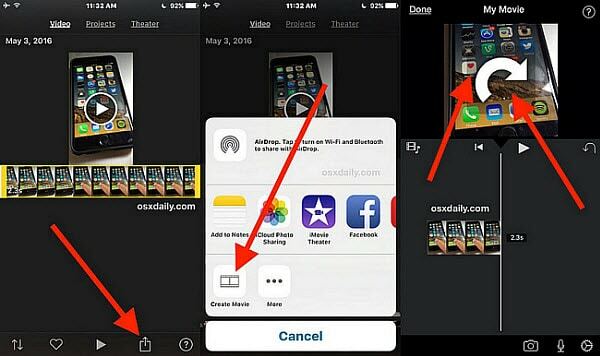 Step 2: Tap the Share button and choose Create New Movie. Step 3: You can see a rotating arrow on the display. To flip video in iMovie on iPhone iPad, perform a rotate gesture with two fingers and rotate the video into the right direction. You can see, you can rotate the video to any direction with iMovie for iOS. Step 4: Tap Done to apply the rotating. 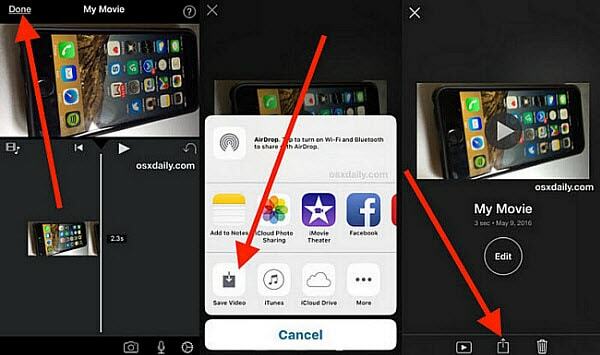 Step 5: Then tap Share again and choose Save Video. You can also upload the rotated video to YouTube, Facebook, iCloud, etc, or save the video in 360p, 540p, 720p, or 1080p. Also check how to flip videos with Handbrake. Rotating video in iMovie on iPhone iPad or computer is easy, but it doesn't mean it's the best way. Below are some facts that you need to note when you use iMove to flip a video. 1. iMovie only allows you to rotate videos in MP4, HDV, AVCHD, Apple Intermediate Codec, Apple Animation Codec, Motion JPEG/A, iFrame, h.264, MOV. 2. iMovie has limited storage. You are allowed to add 18 clips to the rotator only. 3. It takes long time to rotate videos in HD or K4, and export rotated videos into the format you want. 4. iMovie is not user-friendly. It's challenging for beginners to find the rotating buttons. OK, if the above limits hinder you rotating video in iMovie, maybe you can try to rotate video in iMovie alternative - MacX Video Editor. 1. You can rotate video in 90°, 180° or 270° and flip videos horizontally. 2. You can rotate videos in any 4K, HD 1080P, 720P, SD videos in any formats. 3. You can edit videos, compress video size, add watermarks, subtitles, merge and crop videos and do more. 4. You can export rotated videos to mp4, mov, avi, 3gp, flv, wmv, mkv, youtube, facebook, vimeo, iPhone, iPad, any format & devices. 5. You can enjoy 5x faster speed without any quality loss. Step 1: Free download the iMovie alternative on Mac (it supports macOS High Sierra, Sierra or earlier). Let's see how to flip a video in iMovie alternative now. Step 2: Launch it and click Import to load the video you'd like to rotate. Click the scissor icon below the video to enter into the video editing page. Then click General and you will see two rotating buttons on the right corner below the video screen. Step 3: Click either buttons to flip video in iMovie alternative in 90°, 180° or 270° or anti-orientation. Step 4: Make other necessary edits and click Done. If you want to export videos into other formats, select the specific file or device and then click Run and start to rotate video in iMovie alternative. 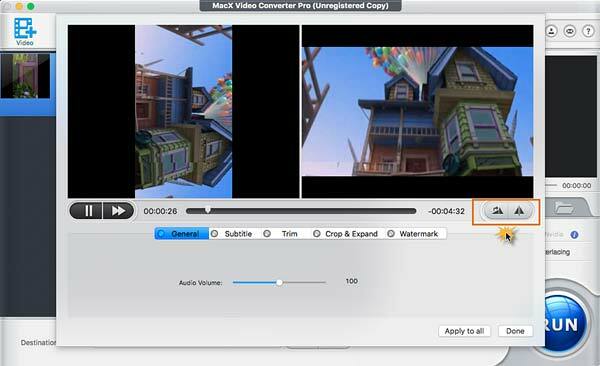 MacX Video Converter Pro will rotate any video files in H.264, HEVC, MOV, MP4, AVI, FLV, 3GP, MKV etc in 4K UHD, HD 1080P, 720P or SD resolutions. You can flip videos to 90°/180°/270° and rotate videos horizontally instantly.